Since the evening of Easter Sunday, April 16th to Wednesday, June 21st, I have been in Aixen-Provence, France. Those two months, besides enjoying coffee at the local cafes, while listening to street musicians playing soft French Folk Music, my novitiate classmate, Fr. Tim Paulsen OMI and I were on a spiritual quest. Now mind you, it was not as dramatic as one by “Indiana Jones,” but nevertheless important. Fr. Tim and I were rediscovering our charism as Missionary Oblates of Mary Immaculate by being in the same city where our community was started by our Founder, St. Eugene De Mazenod in January 25, 1816. We were accompanied by 13 other Oblate priests from around the world including Indonesia, Hong Kong, Japan, Canada, Scotland, Sri Lanka, Natal, Namibia, Zambia and the USA. Our program had presentations about the life of St. Eugene along with the early history of the community, and tours of early Oblate missions, along with a 15-day silent retreat in the French countryside. We were reminded of how St. Eugene desired a community of men to help those who are “most abandoned” by the world by proclaiming the Good News. There were successes and struggles in those early days just like today. 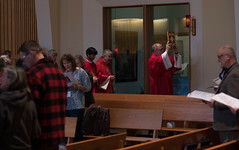 Yet, one of the impressive features of this program was listening and learning from the Oblate participants themselves. To hear about their challenges and joys in sharing the Good News of Jesus Christ, especially the Oblates who minister in the Southern Hemisphere. They helped put my ministerial assignment in Sitka in perspective. The lesson that I learned from this experience can be best summed up in the Gospel of John, (John 21:21-23), where Peter asks about the Beloved Disciple and his relationship with Our Risen Lord. 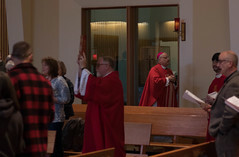 Jesus just calmly calls Peter back to the purpose of all of us, who believe in HIM and that is simply “Follow Me.” That is my goal now as an Oblate priest in Sitka, Alaska, to help people discover their personal relationship with Jesus and let Jesus lead us all. This epiphany from this experience, Jesus’ invitation for us to “Follow Me,” speaks more than all the verbiage and noise, our world can create and I pray that all of us can like Peter and the Beloved Disciple heed His Call.